In 1940 as many as 8 out of 10 high school graduate teen boys went to war. The teenage boys and college age young men who remained were part of a new fashion movement that was entirely designed for teens by teens. Last week we looked at 1940s teenage fashions for girls who adopted men’s clothing for their new wardrobe. Boys, too, adopted men’s clothing for their wardrobe but put a more casual, relaxed spin on it. Their styles were not as extreme as the girls’, but none the less an important shift in fashion history. Boys 13-18 and young men 18-22 wore clothing that looked like younger versions of their fathers, at least to church and school. Dressing nice meant a suit and tie fit for their growing bodies. The older they grew, the more and more alike their and their fathers’ clothing looked. The right of passage for any boy turning into a man was to wear pants instead of knickers. Knickers were a childhood fashion. Yes, they wore pants, too, but if a teen was wearing knickers in high school it was an utter embarrassment! Teenage suits were made in single- and double-breasted styles with a wide square shoulder and straight drape to thigh. Lapels were quite wide with a notch or peak point. A white pocket square was always folded neatly and worn in the breast pocket. Pants fit high up the waist to just under the ribs and had a single or double pleat leg. The overall look was quite wide, although due to restrictions during the war years they were a bit narrower then. Suits’ colors and textures were the same for boys as parents: solid, chalk stripe or pinstripe blue or brown, and brown or tan windowpane plaid. The one missing color was grey. A grey suit was closely tied to a business men’s look, which was too mature for teens and younger men. Suits were accessorized with a solid white or colored button down dress shirt with pointed collar and a necktie. Ties were colorful for all men in the 1940s, but I imagine teens appreciated the most colorful and bright colors — like red stripes, bright blue and fun deco prints — more than their elders. 1944 Collegiate suits were a bit more refined (tailored) than teen boys. 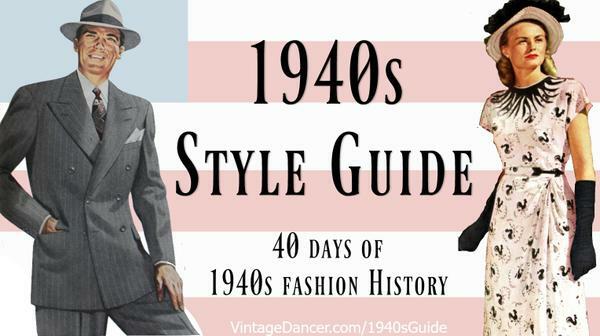 College age young men’s suits had a similar look to 1940s teenage boys suits but were overall more refined, fitted and well-tailored to the body. The ideal fit was a broad shoulder with a narrowed in waist and straight fit down through the hip to ankle. The silhouette echoed a man, not a boy. The same solid colors and windowpane patterns were worn. One new style was the white pants with blue double-breasted blazer collegiate look. This was never worn by teen boys, only college kids who were often part of a fraternity. It was a style carried over since the 1920s and one still associated with college men in Europe and at East Coast colleges. Video: Advice for teens to dress well. 1944 Teens Casual Pants and Shirt. A full suit and tie wasn’t always necessary to dress nice. The American trend was to dress more casual, something teens embraced the most. A sporty teen look consisted of a set of pants, shirt and jacket that did not match like a suit. Pants came in a variety of richer colors such as green, bright blue, light tan, and chocolate brown. They fit high on the waist with a pleated waist band. For some reason teens never seemed to buy the right size pants. They were purchased one or two sizes up and held up with a belt. The extra bagginess of the fit was a style statement just for teens. Were they more comfortable that way? Probably so. Or perhaps they were a hand-me-down from Dad. The sport shirt was a button down with a wide, unbuttoned point collar. They came in short or long sleeves with two breast pockets. Again, colors were more vibrant than a dress shirt with medium blue, yellow, red, and tan entering the mix. New patterns of plaid, checks, and stripes emerged as well as prints featuring favorite hobbies, sports and Western themes. The 1940s boy and young man was all about Western movies. There was a cowboy hiding in all of them. Dressing like one was about as fashionable as you could get. The war years introduced a newer style of shirt: a knit pullover shirt called a Polo shirt in the early ’40s and later called a T-shirt. Military men wore T-shirts as an undershirt but continued to wear them as outerwear when they came home. Fashion houses caught on and produced T-shirts for the ultimate casual shirt. They were also brightly colored with horizontal stripes and printed designs. Unlike T-shirts today, they had a rib band around the arms and waist making them fit slim and tucked into pants. The knit was thicker than today’s jersey fabric, too. 1940s teenage sweaters also fit a bit on the snug side. They came in either a pullover or button up cardigan style. Pullover could be solid colors or with a woven design, such as the argyle print on the right. Trendy animal print designs were a brief fad that girls wore, too. A sport jacket fit like a suit jacket but featured an open lapel just like sport shirts. They buttoned up with only two or three buttons but were often worn unbuttoned as well. To dress up a sport suit, a dress shirt, tie and possible pullover vest were worn. To dress down a sport suit only a sport shirt was worn underneath. A T-shirt might have been worn, but it was a bit to casual, even for freedom loving teens. The sport jacket was a mix of solid and patterned fabrics. Plaid sleeves with a solid body or plaid body with solid sleeves were both common. Just plaid or just solid were fine, too. The idea was always to contrast the jacket with the pants and wear a bright un-matching shirt underneath. It was a color clashing time in fashion for sure! There was one other sport look for teen boys: a matching sport shirt and pant set. These were often known as men’s uniforms for work wear. Boys and teens, however, liked them for playing sports and working summer jobs. Mother liked them because they were made of a sturdy cotton that withstood the abuse of a boy’s activities. Colors were brighter greens, blues and tans, but never in a pattern — always a solid color. A leather belt held up all pants–sporty or dressy–although suspenders could still be worn too. Suspenders were designed to stand out even if no one saw them. Red, blue, black, and yellow in solid colors or vertical stripes were in style. 1940s boys and teens loved a belt with a western embossed design. Silver metal tips and buckles added even more Western influence. The teenage boy fashion that gets all the attention was only worn after school and on weekends. Rolled cuff denim jeans, button down shirts, a belt and saddle shoes — just like the girls. In the summer, short sleeves were worn rolled up. They could be dress shirts or sport shirts, that didn’t matter. They had to be well worn, too. Nothing too new would do. Jeans, too, had to look rugged and used. Shoes were never clean, always dirty. Naturally, teenage boys didn’t want their clothes to actually be too dirty, just the appearance of it. Cleanliness for boys was just as critical as it was for girls. Good grooming went a long way towards getting a date. Hairstyle for teen boys include a side part, trimmed sides and wavy volume on top.Hair was neatly groomed into place each day with the use of some hair styling oil. Not too much though! The greaser look was coming up in the 1950s. In the 1940s hair was only lightly oiled to tame fly-a-ways and provide some shape. For older boys and teens a hat was hardly ever worn with a causal suit, only with a dressy suit, and even then it was optional. Teen-sized fedora hats with a pinch front crown, grosgrain band and a colorful feather on the side looked just like men’s hats. Many boys and some young teens still choose to wear military hats, too– especially during the war years. Navy or Army berets or uniform hats as well as white sailor hats all had their place in a boy’s life. Teens, in general, chose not to wear hats until college or beyond. 1940s teenager shoe styles were also tied to the formality of the dress. School or church suits needed a pair of clean lace-up Oxfords in black or brown. Sport suits and casual jeans were all about wearing two-tone shoes. Saddle shoes, with the center panel black and heels and toes white, were the most trendy style for teens. Any combination of brown and white or black and white two-tone shoe was in fashion for the entire 1940s. The casual loafer shoe was ideal for wearing with sport clothes or denim jeans. A rugged pair of lace up boots was necessary for working part time labor jobs. For sports like Basketball, a pair of Converse or off-brand lace-up sneakers were worn. Underneath teenage boys clothing was some simple underwear. A snug fitting cotton knit undershirt, with ample arm holes, was worn either under a pair of white briefs or shorts. Briefs look a lot like men’s tidy whities today. They could be cut away at the thigh or a lit longer like bike shorts. Teen undershorts are a vintage version of boxer shorts. They buttoned up the front but flared out the legs. They were colorful– stripes, being the most popular.